Los Angeles, CA – On Wednesday (January 16) at The Peppermint Club located in Los Angeles, CA, Nipsey Hussle celebrated his Grammy nomination for his breakout album, Victory Lap. Sponsored by Puma and complete with drinks served up by CÎROC and DeLeón Tequila, industry legends came out to show their support including JAY-Z, Snoop Dogg, T.I, Dave Chappelle, DJ Mustard and Tiffany Haddish as well as host of family, close friends and the All Money In Team. The upscale atmosphere set the right tone to celebrate all the accomplishments from the past 365 days. He famously sold his Crenshaw mixtape for $100 each in 2013, catching the eye of Hov — who bought 100 copies for a grand total of $10,000. Nipsey is no stranger to success but following Victory Lap’s in February 2018, everyone took notice, including HipHopDX, who awarded him with the 2018’s Hardest Working Artist Award. The album also ranked No. 4 on the Top 20 Albums of 2018 list. With a full room and the drinks flowing, DJ Trauma spun album tracks as members from producing group masters, 1500 or Nothin’, jammed out to it in the background. 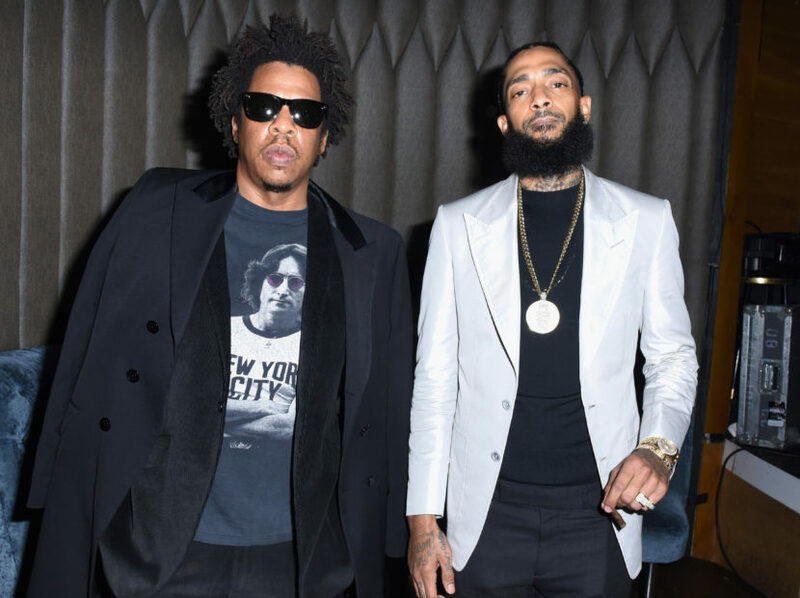 Tucked in the V.I.P area and nodding their heads to various tracks, JAY-Z, rocked a John Lennon graphic tee while Nipsey kept it classy with a blinged-out chain and a white blazer. The 61st GRAMMY awards are set to take place February 10th in Nipsey’s hometown of Los Angeles. Seeing that that this is his first nomination, all of his fans will be watching to see if he will take home the Golden Statue.